With numerous changes occuring in the IT industry, the identity management market is heating up more than ever before. Web applications, wireless networks, cloud storage, and much more are shifting the IT space rapidly. As a result, admins are looking for new solutions. One solution in particular that IT admins are searching to replace is Microsoft® Active Directory® (AD). This management tool has been around for nearly two decades now, and IT organizations have had enough. 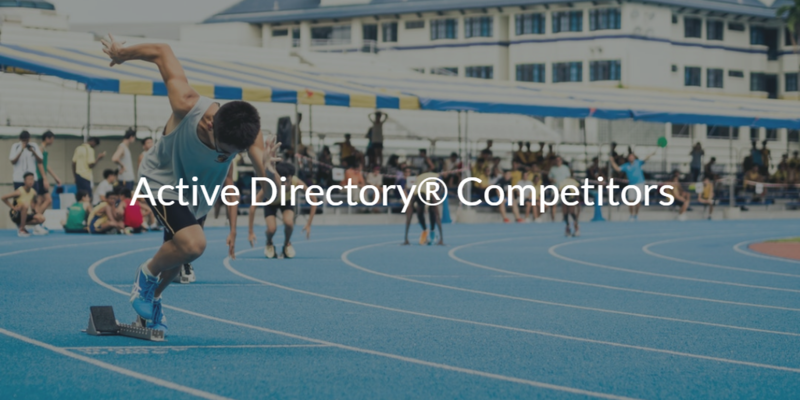 It’s time to start looking for Active Directory competitors. Microsoft AD has been incredibly dominant in the directory services space. It may just be the highest market share solution that they have. But the most impressive part about it is how Microsoft has been able to leverage AD as an advantage in the rest of the IT market as well. By refusing to support competitors, they have been able to lock their customers into Windows® systems and applications for many years. But you can only stall innovation for so long. While in the past the IT network was Microsoft-centric, the IT network today is no longer as clear cut. It has moved far away from the Microsoft controlled on-prem environment that AD was built for. With 3 in 4 users choosing Macs® over Windows systems, there has been nothing Microsoft could do to prevent their entrance into the enterprise. Today, there are more Mac and Linux® machines than ever. Web applications have become incredibly popular, and they are accessible via a browser and not tied to Windows. The data center is shifting to AWS and GCP, and Linux servers are beating out Microsoft servers for popularity. In fact, 75 percent of enterprises report that they use Linux as their primary cloud server platform. G Suite is challenging Office and Office 365 for the productivity platform within an organization. Windows File Server is being replaced by either on-prem options like Samba file servers and NAS appliances, or cloud options like Box, Google Drive, and Dropbox. These are just some of the changes in the IT environment, and there are many more on the horizon. In short, the reason that IT organizations chose Active Directory – to control access to their on-prem Windows systems and users – is slowly fading away. Now, they need a solution to support cloud and non-Microsoft solutions. All of these changes make it clear why IT admins are considering Active Directory competitors. So, what options are there? Of course, there are the historical open source options like OpenLDAP™, Samba, and FreeIPA. However, these solutions just don’t cut it for the modern IT environment. Just like Active Directory, these solutions are generally on-prem, require a great deal of maintenance, and are limited in some way in enabling IT organizations to choose whatever IT resources they want. In addition, Samba and FreeIPA often necessitate working with AD to get full coverage. This is the exact opposite of what admins are looking for. When you really dig into researching Active Directory competitors, you realize that (until recently) there really haven’t been any clear commercial alternatives to Active Directory. There were IDaaS solutions, but these were really just web application single sign-on platforms. You could also try directory extensions or identity bridges that would connect to Mac and Linux systems, but they still required an AD instance to link back to. Nearly every solution out there has been predicated on AD, and the more that you add on the more cost and complexity you add. When looking to eliminate Active Directory and fully move to the cloud, the options were rather slim. Fortunately, the time of being stuck with Active Directory alone is in the past. Now, there is a true Active Directory competitor that can be a complete replacement to AD. This solution is called JumpCloud® Directory-as-a-Service® and it is Active Directory and LDAP reimagined for the modern workplace. JumpCloud is able to manage users and their systems – whether they are Mac, Windows, or Linux – and provide access to cloud and on-prem resources like O365™, G Suite™, Salesforce®, and Jira®. The same login credentials will connect a user to the network and file shares via RADIUS and Samba, securing both your WiFi and file server access. Plus, regardless of the platform, protocol, provider, or location, your users and systems can be connected via JumpCloud. By leveraging a cloud-based Active Directory competitor, IT organizations can truly choose the best solutions for their business. This puts control back in the hands of IT, and ease of access back into the end users workflow. Check out JumpCloud Directory-as-a-Service for free, and see what the future of IT looks like.